Jack Robinson's double gave QPR their first away success of the season with a narrow win at lowly Birmingham City. The visitors went in front when Robinson headed home a Luke Freeman free-kick from close range. On-loan Southampton striker Sam Gallagher equalised when he poked home after Alex Smithies spilled Maikel Kieftenbeld's effort. Robinson, who had never previously scored before Saturday's game, won it with a fine low shot. 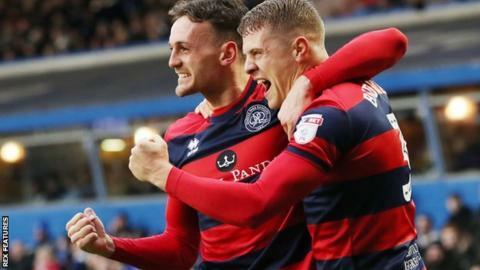 Defeat by the R's saw Blues slip to the bottom of the Championship, boss Steve Cotterill having guided them to just two wins during his 11 games in charge. Victory was a welcome boost for opposite number Ian Holloway as it ended a 17-match winless run away from Loftus Road, dating back to a 4-1 success at St Andrew's in February. Former Liverpool, Wolves, Blackpool and Huddersfield Town defender Robinson's double ended his seven-and-a-half-year wait for a goal in professional football. QPR host promotion hopefuls Bristol City next week, while Blues visit fellow strugglers Sunderland. "We now have to work harder to get out of trouble. Some of the problems we had last season we still have. There is no quick fix to this situation. "It is not all about adding new players as the current players are burdened with the problem. I cannot fault their efforts. "I do not think we deserved to lose. We deservedly got the equaliser and I thought we were going to go on and win as they were on the back foot." "We had to show character and believe in what we were doing. The first goal was vital, but what pleased me was the way we hit back after Birmingham equalised. "We have had so many defensive injuries it has been extremely difficult. This was an immense result and I was pleased how it was achieved. "The away win has been a long time coming, but we have had to shake it off. This division is frightening as there are teams who have gone eight games without a win." Match ends, Birmingham City 1, Queens Park Rangers 2. Second Half ends, Birmingham City 1, Queens Park Rangers 2. Attempt missed. David Stockdale (Birmingham City) header from the centre of the box misses to the right. Assisted by Craig Gardner following a set piece situation. Hand ball by Pawel Wszolek (Queens Park Rangers). Attempt missed. Lukas Jutkiewicz (Birmingham City) left footed shot from outside the box is high and wide to the left. Assisted by Jonathan Grounds with a headed pass. Hand ball by Idrissa Sylla (Queens Park Rangers). Offside, Queens Park Rangers. Josh Scowen tries a through ball, but Pawel Wszolek is caught offside. Idrissa Sylla (Queens Park Rangers) wins a free kick in the defensive half. Substitution, Queens Park Rangers. Grant Hall replaces Luke Freeman. Substitution, Birmingham City. Lukas Jutkiewicz replaces Jota. Corner, Birmingham City. Conceded by Pawel Wszolek. Goal! Birmingham City 1, Queens Park Rangers 2. Jack Robinson (Queens Park Rangers) left footed shot from outside the box to the bottom right corner. Assisted by Luke Freeman. Corner, Queens Park Rangers. Conceded by Jacques Maghoma. Offside, Birmingham City. Jonathan Grounds tries a through ball, but Jeremie Boga is caught offside. Attempt missed. Idrissa Sylla (Queens Park Rangers) header from the centre of the box is close, but misses to the left. Assisted by Jake Bidwell with a cross. Substitution, Birmingham City. Jacques Maghoma replaces David Davis because of an injury. Attempt missed. Jota (Birmingham City) left footed shot from the centre of the box misses to the right. Assisted by Jonathan Grounds with a cross. Offside, Birmingham City. David Davis tries a through ball, but Jota is caught offside. Attempt missed. David Davis (Birmingham City) right footed shot from outside the box misses to the left. Matt Smith (Queens Park Rangers) is shown the yellow card for a bad foul. Sam Gallagher (Birmingham City) is shown the yellow card for a bad foul. Attempt missed. Craig Gardner (Birmingham City) right footed shot from outside the box misses to the left. Offside, Queens Park Rangers. Jake Bidwell tries a through ball, but Conor Washington is caught offside.